Namefruits' ingenious Naming Assistant takes care of all your naming needs, from conception to checking the chosen name. All you need to do is simply say what you like and what you don't. Lay the foundation for a strong brand name now and start with a unique name for your business. Namefruits is a super-intelligent Naming AI for business names – and much more. We think a step ahead to simplify the whole process for you – from the first idea all the way to the final name. It's almost like finding names by magic! No lengthy user manuals, no complicated tutorials: Simply answer easy multiple-choice questions about your project – Namefruits takes care of the rest and suggests personalized, unique and creative name ideas. You simply have to choose which one you like best. With its dynamic "Juicer" questionnaire, Namefruits determines your requirements and independently researches additional data. Soon your naming project will chock of ideas you would never have even imagined. Pretty creative! It usually takes a lot of time and effort to create a fitting business name or brand name – from weeks to even months. Namefruits conjures up plenty of name ideas after just a few hours, pre-checked and ready to go. Quite a time saver! Serious or playful, creative or traditional, wild or tame: Namefruits is a naming genius capable of creating a great variety of name types, always according to your tastes. As a founder, start-up, or SMB you probably have more important matters at hand than wasting your time trying to find the perfect name. That's why our naming AI does the work for you. Even if you don't know which direction you want to go with your business name: Namefruits will find out for you! Project definition, USP, idea research, name creation, usability checks, and so forth... Naming is a complex process, and as a layman it's easy to lose track. That's why Namefruit thinks ahead and takes care of all important aspects of the naming process for you to help you find the best name for your project. Discover the future of naming. Namefruits uses over 600 labels to characterize you and your project to make sure all name ideas really fit you. Namefruits can create over 70 different types of names – from serious to creative, from down-to-earth to extraordinary. Namefruits checks the quality of all generated names and if they are fit for use. So you can be sure that all the right boxes have been ticked before deciding for a name. Namefruit's underlying technology has already served over 100.000 users. The new naming AI makes finding the perfect name even easier now. Namefruits combines intelligent naming methods with state-of-the-art big data concepts. The result is an artificial intelligence specializing in creating, personalizing and testing professional business names – almost without any human's helping hand. Namefruits ist being developed by the team who developed NameRobot, Europe's number software for business naming solutions since 2010. Namefruits will learn as much about you and your project as possible in order to generate personalized name ideas for you. Don't worry: your data is safe with us and will be stored anonymously. The technology behind the stage is well-established: Namefruits utilizes the name generators developed by NameRobot – a technology trusted by over 100.000 registered users. Namefruits thinks ahead: One-of-a-kind tools for name creation and clever algorithms for choosing the right keywords and types of names are combined in a unique manner to ensure creative name ideas. The NameReport is a super useful tool to decide if your name idea is suitable for your project or business. You will receive it upon completion of the naming process with Namefruits. The NameReport lists the most important facts and marketing opportunities for your name idea in a concise PDF document. 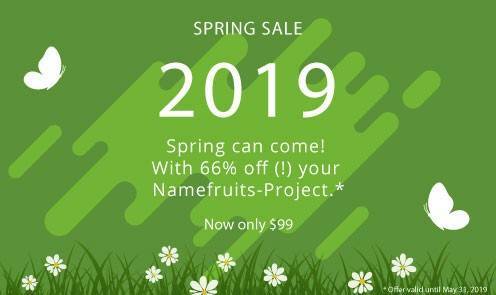 Namefruits is a naming AI which creates original and personalized business names for your project – using clever algorithms and fully automated processes. That's how Namefruits finds the best names for your start-up or product. Namefruits has ambitious goals. If you want to know where the journey is going, take a look at our Namefruits roadmap. This is the itinerary to the future of naming! Nomen est omen! A strong name is important for the success of your project. Start your enterprise right with the best name possible and lay the foundation for a successful brand. A strong name makes you more successful. That's because a name says more than a thousand words. Become successful and create a radiant brand – with the perfect name! A strong name makes you memorable. Only a strong start-up name attracts the attention of partners, investors and customers or clients. Be present with your business – with a memorable name! A strong name helps you obtain more financial support. No matter how you monetize your start-up, the right name will have the power to open the right doors. Convince your backers from the start and introduce your project – with a promising name! A strong name is the best marketing tool: You can only attract attention in your niche if you have a unique name. Use this free advertising boost – with a noteworthy name! A strong name makes your business grow. The right company name is easy to remember because you cannot simply replace it with something else. Make sure your target group can remember your start-up – with a positive name! On average, it takes a founder eight weeks to find a business name! But you probably don't want to waste time with research and brainstorming sessions to find a name because you have a lot of other things on your to-do list. That's where Namefruits comes in. In just a few hours, you can christen your business and proclaim it proudly to the world. Naming has never been so intelligently simple. Test it without any risk. Name your business right now! Are you founding a business or self-employed? Maybe you already started thinking about business names, or maybe you have no ideas yet. Stop racking your brain and let Namefruits find a name for you. You buy your bread at the bakery. You buy your shampoo at the drug store. Why not get your business names from Namefruits? Namefruits thinks outside the box for you and finds names that fit like a glove. And if you don't like the results you can make use of our included Name Ideas Guarantee.